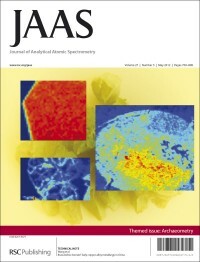 The latest issue of JAAS is now online, which is a themed issue featuring papers from the 2012 US Winter Conference on Plasma Spectrochemistry, which was held 9–14 January 2012, Tucson, Arizona USA. An overview of the conference can be found in the Editorial by Ramon M. Barnes. 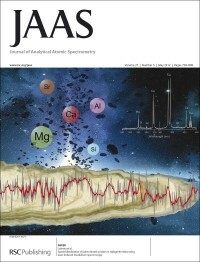 The front cover features work from our new JAAS chair Frank Vanhaecke, Ghent University, Belgium, and colleagues who used multi-collector ICP-MS to test for transition metals in human blood. They looked at metabolically important metals such as Cu, Fe and Zn and examined the differences in their levels in the blood of people with differing diets. On the inside front cover there is an image from Nicolas H. Bings and colleagues from Johannes Gutenberg-University Mainz, Germany, who were looking at the accuracy and precision of analytical data from the analysis of liquid samples. These two cover articles will be free to access and read for 6 weeks, so click through and take a look. We have a HOT paper from JAAS Editorial Board member Gary M. Hieftje, Indiana University, USA, who with colleagues presents a modeling investigation into the thermal mechanism for the formation of electrical prepeak and pressure waves in a microsecond direct current pulsed glow discharge. The latest ASU on Elemental Speciation is also available in this month’s issue. 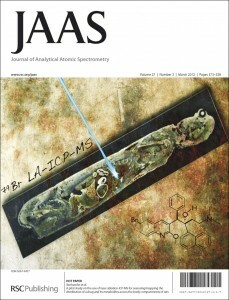 JAAS Issue 6 now online! The latest electronic issue for JAAS has now been published online for you to take a look at. In this month’s issue we have two very eye-catching covers as well as an additional HOT article for you to read. From Venezuela, José Chirinos at the Universidad Central de Venezuela, and colleagues have been using a novel method to prepare crude oil samples for analysis. By encapsulating the samples in xerogel, they avoid splashing effects of the crude oil. Their colourful image appears on the outside front cover. On the inside front cover we have an image from a HOT paper from a team working in France. Jennifer Mabry and colleagues from the CRPG-CNRS, specializing in petrology and geochemistry, have been mapping changes in helium sensitivity and peak shape. This has been achieved by tuning a Nier-type ion source which involves adjusting many different parameters, such as the total extraction voltage, the half-plate bias, the repeller voltage, and the electron energy. In this June issue we also have an additional HOT article for you to read. Michael Okruss and co-workers from Leibniz-Institut für Analytische Wissenschaften, Berlin, Germany, have used graphite tubes with internal diameters of 1 mm, 1.5 mm and 2 mm (mini tubes) in high resolution continuum source graphite furnace atomic absorption spectrometry (HR-CS GF AAS). The use of these mini tubes allows high absolute sensitivity and ultra-trace analysis of small samples. Click on the title below to read more! 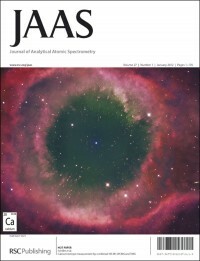 JAAS Issue 4 now online! 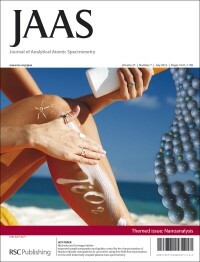 Issue 4 of JAAS is now available online. On the front of the journal this month is a picture from Joshua R. Dettman and John W. Olesik from The Ohio State University, USA. John is actually our Regional Associate Editor for the Americas and is on our Editorial Board. Their paper is on the use of a single element calibration standard in semi-quantitative ICP-OES analysis. Using this method they were able to measure a total of 66 elements. On the inside front cover we have a colourful image from Joachim Franzke and colleagues from the Leibniz-Institut für Analytische Wissenschaften in Germany. Their work has focused on the development of a new type of microhollow cathode discharge that can be used in analytical microplasma gas detection. These articles have been made free to access for 6 weeks so make the most of this and take a look! 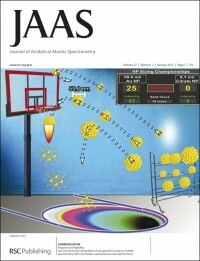 Issue 3 of JAAS now online! JAAS issue 3 is now available online. The front cover of this issue features work by Frank Vanhaeke and colleagues from Ghent University and Janssen Research & Development, Belgium. They use laser ablation-inductively coupled plasma-mass spectrometry (LA-ICP-MS) for assessing the distribution of a novel anti-tuberculosis compound containing bromine and its metabolites in rats. Compared to the traditional radioluminography technique, the LA-ICP-MS method does not require labelling of the drug compound with a radionuclide. The inside front cover highlights work by R. Escobar Galindo and co-workers from Spain and Luxembourg, who report the in-depth multi-technique characterisation of chromium-silicon mixed oxides produced by reactive ion beam mixing of the Cr/Si interface. There is a great deal of interest in mixed metal-silicon oxides due to their suitability for a variety of applications, including as optical coatings with an adjustable refractive index. The authors employed a variety of techniques to look at the in depth composition and concentration profile of these materials. 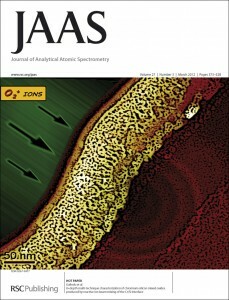 Issue 2 of JAAS for 2012 is now online! The front cover this month features work by Magdalena Szczerbowska-Boruchowska and colleagues from the AGH University of Science and Technology and Jagiellonian University, Poland. They present a synchroton radiation micro-X-ray absorption near edge structure study of sulfur speciation in human brain tumor cells. The authors looked at both the experimental and methodological aspects of 2D imaging of sulfur species in tumor cells, and developed procedures to eliminate disrupting effects in the imaging distribution. The inside front cover highlights work by Michael Krachler and Detlef Wegen from the European Commission-Joint Research Centre in Germany, on the promises and pitfalls in the reliable determination of 233U using high resolution ICP-OES. They show that the current analytical approach for determining 233U at λ = 385.950 nm is not specific to that particular uranium isotope for reliable quantification. The authors show instead that analysis at λ = 411.585 nm is potentially a better option for reliable determination of 223U using HR-ICP-OES. All these articles are free to access until the 20th February 2012, so why not take a look! First cover articles of 2012: Issue 1 now online! 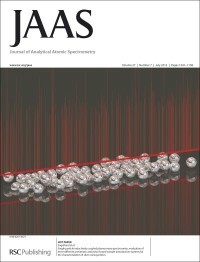 We may be a few weeks away from the New Year, but JAAS has an early present for you: the first issue of 2012, which is now online. We are looking forward to another successful year publishing the best research related to analytical atomic spectrometry, and begin with some excellent cover articles. Our celestial front cover features work from Martin Schiller, Chad Paton and Martin Bizzarro from the Centre for Star and Planet Formation, which is based within the Natural History Museum of Denmark at the University of Copenhagen. The resolution of their data shows significant improvement compared to previous methods, which allows for a better understanding of the mass fractionation laws responsible for the mass-dependent fractionation of Ca present in natural samples and synthetic standards. Their work also provides insight into a better reference material to study the calcium isotope composition of terrestrial and non-terrestrial materials. We highlighted this work when it was first published as an Advance Article, and are delighted to feature it on the front cover of this issue! Featured on the inside front cover, work from Efthymios Kapellios and Spiros Pergantis of the University of Crete, Greece. They provide the first demonstration of the combined use of nanoelectrospray ion mobility spectrometry (IMS) with off-line inductively coupled plasma mass spectrometry (ICP-MS) for determining engineered nanoparticles in aqueous solution. Coupling the resolving power of IMS with the sensitivity of ICP-MS, make this an attractive approach for nanoparticle analysis. The technique shows capabilities to determine size and metal content, and could, in principle, be used to determine nanoparticle concentration. Don’t forget these cover articles will be free to access for 6 weeks, so enjoy them and let your colleagues know. The last issue of 2011 is now online! On the front cover, Cerutti and colleagues from Argentina present their work on a novel on-line scandium preconcentration system implemented with chemical vapor generation associated to inductively coupled plasma optical emission spectrometry (VG-ICP-OES). Highlighted on the inside front cover, Joerg Hippler of the University of Duisburg-Essen and co-workers have developed a methodology to speciate and quantify the unconjugated intracellular arsenic species in hepatocytes and urothelial cells. Both these articles are free for 6 weeks, so take a look and do let your colleagues know. We’d like to thank all our cover authors for 2011 and look forward to bringing you more excellent papers and images in 2012. The latest issue is now online, with iodine all over the covers. Ok, not literally, but work involving this element is certainly highlighted. On the front cover, JAAS Editorial Board member Norbert Jakubowski and colleagues in Germany present a new laser ablation (LA)-ICP-MS method for single cell and cell nucleus imaging. Iodine was employed as an elemental dye and the spatial resolution attained was sufficient to detect even smaller cell nuclei within a liver biopsy tissue. On the inside front cover, Pilar Bermejo-Barrera of the University of Santiago de Compostela and colleagues provide a review of recent literature focused on iodine determination/speciation in environmental, biological and clinical materials. Both the cover articles are free to access for six weeks, so take a look and make sure your knowledge on iodine and analysis is up-to-date!